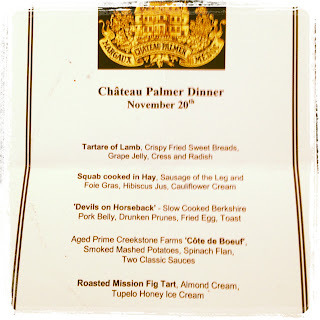 My thirteenth best meal of the year featured a combination of amazing wine from Chateau Palmer paired with the flawless food of chef Aaron Brooks and his team at Edge Steak & Bar. The dinner was hosted by Andrew Lampasone owner of the great wine shop in Ft. Lauderdale, Wine Watch. I highly recommend visiting his "cave" where you will find some very good bottles. He also hosts several tastings and dinners throughout the year that I would encourage you to attend. You can find upcoming events here. Unfortunately, I didn't take any notes during the tasting so I'm not going to go all Parker on you. But, I can tell you that these were incredible wines and having the opportunity to do a vertical tasting with wines dating back to 1995 was an excellent learning experience for me. 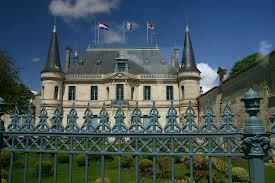 It was also a treat to sit next to someone from the Chateau who was able to share a tremendous amount of information about the vines and the production process. Chef Brooks knew he needed to bring his A game and he did. Each dish offered great combinations of ingredients and flavors which is a trademark of chef Brooks. If you still haven't made it down to the Four Seasons and Edge Steak & Bar, do yourself a favor and go. Chef Brooks is easily one of Miami's best chefs. The evening started with a champagne reception featuring a very nice Ployez-Jacquemart Brut NV. It is a blend of 75% Pinot Noir and Pinot Meuiner and 25% Chardonnay. The first course was a delightful lamb tartare with crispy fried sweet breads, red grapes, cress and radish. This was paired with a 2008 Chateu Palmer Alter Ego Margaux. The next course was a squab cooked on hay with foie gras sausage paired with a hibiscus jus and cauliflower cream. This was paired with a 2005 Chateau Palmer Alter Ego Margaux. Chef Brooks was feeling evil and served us 'devils on a horseback'. Here, he served a slow cooked Berkshire pork belly with drunken prunes, fried egg and toast. This was paired with a dynamite 2004 Chateau Palmer Margaux and a 2006 Chateau Palmer Margaux. The main course was an aged prime Creekstone Farms 'Cote de Bouef'. It was cooked perfectly and very tender. It was paired with smoked mashed potatoes and a very tasty spinach flan. 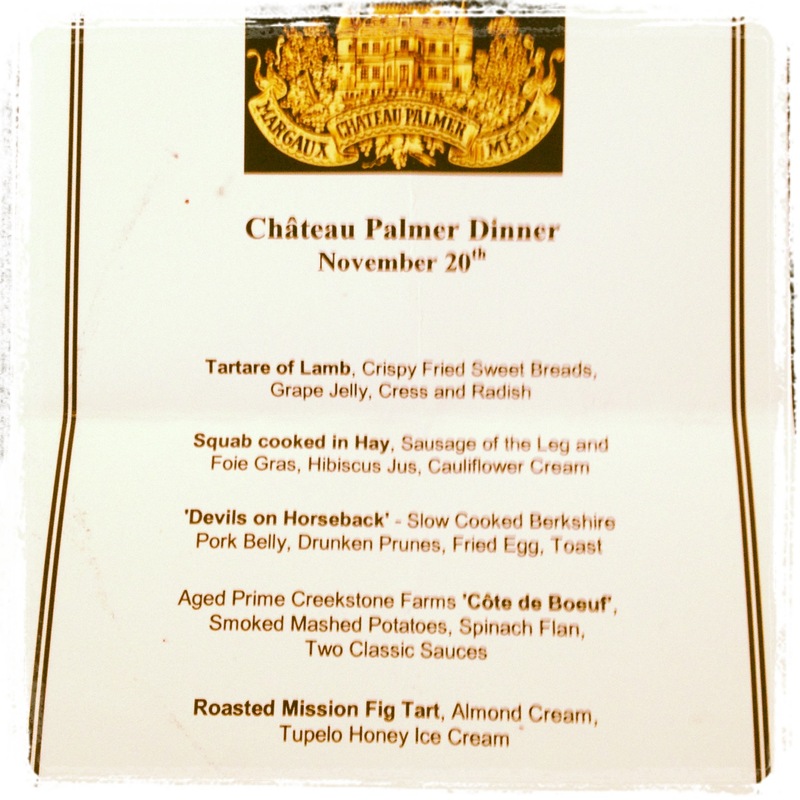 We were treated to a phenomenal pairing of 1995 and 1996 Chateau Palmer Margaux. New pastry chef, Sarah Thompson ended the evening with a nice roasted mission fig tart, almond cream and tupelo honey ice cream. Andrew opted for a 2006 Chateau Lafaurie Peyraguey Sauternes to end the night. Wonderful wines, wonderful experience, wonderful food wonderful night!